Most importantly: Job seekers visiting our site powered by SmartJobBoard.com consistently tell us they like how easy it is to navigate and perform searches. We tried several other solutions prior to implementing SmartJobBoard and found this optino to be the simplest to get up and running with easy to use admin and posting tools. SmartJobBoard is available at various price points which has allowed us to grow into the product which is an ancilary solution to our core business offerings. SJB is always improving with new features and has been kind to entertain and implement several of our feature suggestions. SJB has plug and play integration with Indeed, Jobs2Careers, ZipRecruiter, JobG8, TopResume, GoogleAnalytics, On the social media front: SJB has a fully integrated Facebook job site app that is more stable and reliable than others we've tested. (Related Tip: If you are working with a job-board or talent marketing tech vendor which claims to have a solution to host your jobs on Facebook yet their own company facebook page doesn't feature this tool - be prepared to do some thorough testing) I was pleasantly surprised SJB's Facebook app is truly plug and play ready in the middle and top tier accounts. SJB is worth checking out and offers a free trial. If you have complex third party integration needs, definitely check with the SJB team before getting in too deep. As I understand it the platform is available in both a hosted and self-hosted option - we have encountered some limitation to desired integrations with the hosted version largely given. SJB powers hundreds of job sites as I understand it... If there was one wish list item I'd love to see from SJB - it would be a Facebook group or similar crowdsourced user community to network and share best practices with. Our team is tech proficient enough to be dangerous and perhaps high maintenance at times. Support team is super responsive and patient with our inquiries. We run the HLPA - Hispanic / Latino Professionals Association, large association of over 275,000 members and needed a Job Board solution for our website www.HLPA.com We researched several Job Board services and software programs and ended up purchasing SmartJobBoard after several other services and software programs could not meet our needs or where inadequate. The program has been easy to customize and we would definitely recommend it to others.Great platform to start with and is easily customized. I had used this to make a Japan-based job board. The site has been fairly straight forward and full of features....maybe too many features. The support staff and sales (customization requests) has been much better than expected. I feel as though they are part of my team.Very easy to create new resume fields, layouts, and customization. Very good "My account" for users. Many of the features cannot be found on my competitor's sites so the site is technically superior from day one. Below are some frequently asked questions for SmartJobBoard. Q. What type of pricing plans does SmartJobBoard offer? Q. Who are the typical users of SmartJobBoard? Q. What languages does SmartJobBoard support? Q. Does SmartJobBoard support mobile devices? Q. Does SmartJobBoard offer an API? Yes, SmartJobBoard has an API available for use. Q. 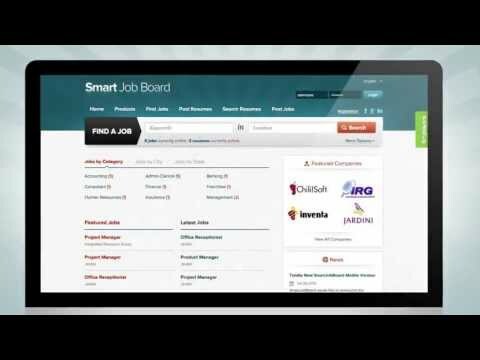 What other apps does SmartJobBoard integrate with? Q. What level of support does SmartJobBoard offer?